The federal government is using a time-honored tactic–smear radicals who support struggles of the oppressed as backers of violence and terrorism. Today, 14 antiwar and socialist activists from Minneapolis and Chicago are facing possible grand jury indictments as a direct consequence of the Supreme Court decision–after their homes and offices were raided last month by the FBI, using warrants alleging possible “material support” of terrorist groups. The activists targeted are involved in numerous political groups, including the Freedom Road Socialist Organization (FRSO) and solidarity work relating to struggles in Colombia and Palestine. The Feds’ investigation centers on whether they gave unspecified material support to the Revolutionary Armed Forces of Colombia (FARC), the Popular Front for the Liberation of Palestine (PFLP) and the Lebanese Islamic group Hezbollah–all groups on the State Department’s list of foreign terrorist organizations. Thus, the fallout of the Supreme Court ruling on our free speech rights is already evident–and the expectations of millions of people that the Obama administration would roll back the worst excesses of the Bush administration’s attack on our civil liberties have been dashed. The ruling was a victory for the Obama administration, which opposed a lawsuit brought by the Humanitarian Law Project that challenged the law’s provision prohibiting material support–specifically, the giving of “expert advice or assistance”–to groups designated as “terrorist” by the U.S. State Department. In his opinion justifying the decision, Chief Justice John Roberts said the motives of the Law Project didn’t matter, and that any assistance to a group on the State Department’s terrorism list represented “material support”–because, even if the assistance was humanitarian training, it would free up resources for other, illegal operations. When the ruling was handed down, Justice Stephen Breyer took the unusual step of reading his dissenting opinion from the bench–something generally reserved for critically important decisions. The Obama administration is every bit as responsible for the decision as the justices. Obama and his Attorney General Eric Holder were supposed to represent a turn away from worst excesses of the Bush administration’s attack on civil liberties. In reality, the administration’s position in support of the material witness law was argued in front of the Supreme Court by then-Solicitor General Elena Kagan–who, today, is a sitting Supreme Court justice, nominated by Obama. The administration has left a long trail of broken promises on civil liberties issues. Not only is the U.S. prison camp at Guantánamo Bay not closed, but the Obama White House has pushed forward with military tribunals–something Obama spoke out against as a candidate. And none of the Bush-era torturers of prisoners of the “war on terror” have ever been brought to justice. More recently, the Obama administration invoked “state secrets” in an attempt to shut down a court challenge by the father of Anwar Awlaki–a U.S. citizen that is reportedly on a list of those who have been cleared for assassination by the White House. Awlaki has never been convicted or even put on trial, yet the Obama administration is not only trying to kill him, but claiming it has the right to do. Federal prosecutors under both the Bush and Obama administrations amassed a list of approximately 150 individuals and organizations put on trial under the law. The primary targets were Islamic charities–often convicted on the thin premise that money for humanitarian supplies nevertheless constituted “material support” for terrorism. 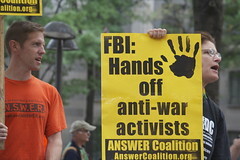 Other targets of the Patriot Act included political activists like former University of South Florida professor Sami Al-Arian, whose case is still dragging on seven years after he was first arrested–and defense lawyer Lynne Stewart, recently re-sentenced to a lengthy term in prison for no more than having issued a press release for her client. Now, the Obama administration is signaling an increased willingness to attack more such activists–especially those involved in the struggle for Palestinian rights, and particularly in the wake of Israel’s attack on the Gaza Freedom Flotilla, which sparked international outrage. Now, with the raids on antiwar and socialist activists, the Obama administration is widening the scope of the attack. It is going after left-wing activists who are engaged in solidarity struggles with those fighting the governments of Colombia and Israel–both allies of the U.S. This is a time-honored tactic of the U.S. government–to smear radicals who support the struggles of the oppressed as backers of “terrorism.” The Feds’ ugly record runs from the Palmer raids and the laws against “sedition” aimed at victimizing anarchists, socialists and communists during and after the First World War; to the McCarthyite witch-hunts of the Cold War era; to the FBI’s COINTELPRO program of surveillance and dirty tricks against left-wing organizations, and civil rights and Black power activists. But it is possible to fight back against this kind of state repression. Hundreds of people turned out for rallies and emergency meetings in Chicago, Minneapolis and elsewhere in the days following the raids–because they recognize the attack on FRSO members and other activists puts all our rights in jeopardy. This is an important first step in building a resistance. During the 1950s and ’60s, the federal government used all kinds of dirty tricks, surveillance and intimidation against civil rights activists. Our side should never forget that no amount of state repression could stop the rising tide of a civil rights movement that finally broke the back of Jim Crow apartheid in the U.S. South. Today, the socialist and antiwar activists being investigated for “material support” have announced that they will refuse to testify in front of a grand jury–a move that is likely to provoke an even more aggressive response from the government. We can’t allow the state to isolate these committed opponents of oppression and injustice. This entry was posted in All Posts News Politics and-or Videos, Civil Rights, Domestic Spying, FBI, Net Neutrality - Internet, Patriot Act, Police State, Politics, Socialism and tagged Activism - Protests - Boycotts, COINTELPRO, Domestic Spying on Dandelion Salad, First Amendment, Free Speech, Meet the new boss the same as the old boss, Police State on Dandelion Salad. Bookmark the permalink. The quote of Debs at the end sums everything up. The time for revolution is now. It can start with a new constitutional convention, defrocking corporations, large banks and insurance companies. this is why the Phelps verses Synder case is so important. Phelps has to win this ! viva la first amendment no matter what. i hope that the phelps push that 1000 yard rule of protest right to public property anywhere.